If you’re in the process of looking for a pool company to build your in-ground swimming pool, no doubt you’ve carefully researched and thought about different construction options for your pool. But, did you know that the pool deck is just as important to consider as the pool itself? The pool deck surrounds, complements, and protects the swimming pool. It is also the area where you will ultimately spend most of your time when outside enjoying your pool. Don’t make material selection for your new or remodeled pool deck an afterthought: Learn about the five best materials used today for deck surfacing — and which is right for your project. 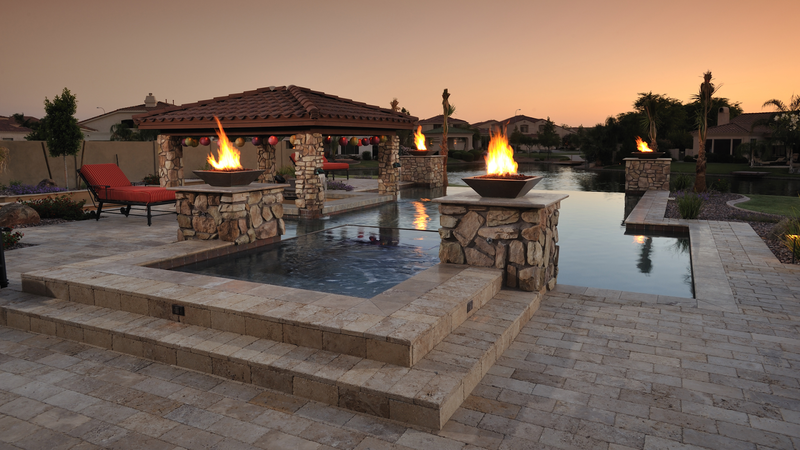 Unlike plain poured concrete, artistic pavers add a distinct touch of elegance to the overall look of a pool space. Artistic pavers can be manufactured with a variety of looks and finishes such as stone, coral, seashell, and tumbled finishes to mimic the look of many types of natural rock for a fraction of the cost. Besides their pleasing appearance and overall aesthetic versatility, artistic pavers have a huge durability advantage over concrete as they rarely develop cracks. Artistic pavers are generally more expensive than basic concrete up front, but their durability spreads that extra investment across a longer time period. Artistic pavers also have the advantage over concrete of being slip-resistant when wet. They also tend to stay cooler than concrete. Travertine, which is a kind of limestone, has been used as a building material since ancient times. Not every pool company offers travertine as an option, but it happens to be a superior choice for a pool deck. Travertine pavers come in many different sizes, patterns, and hues. They are often distinguished by their pitted holes and wavy patterns that resemble those of marble. The different-size pavers available allow pool companies to create unique decorative tiling patterns. Many pool owners prefer travertine for its classic look of sophistication just as much as its durability and resistance to many different types of weather. Travertine nicely complements custom “natural” yard features like waterfalls and boulders. The material is also slip resistant and stays cooler to the touch than many other options. Concrete pavers are manufactured in a variety of shapes and sizes and can be made to look like stone or brick. These types of pavers are made to interlock without grout in the joints, so they are water-permeable and thus a great choice for pool decks. The sheer variety of sizes, colors, and textures means that concrete pavers look good with nearly any type or shape of pool. Concrete pavers are a smart choice for buyers who want something with a classier look than poured concrete but whose budget may not allow for the higher cost of natural stone pavers. Concrete is probably the most common material used to create pool decks, but its two main drawbacks are its tendency to crack over time and the fact that it absorbs and radiates heat so readily. Acrylic topping offers a solution to both of those problems. It’s applied as a liquid to the hardened concrete, and when it dries it forms a protective coating that makes the underlying concrete more resistant to cracking and heat. Acrylic coating also offers better wet traction than basic concrete, so it makes concrete pool decks safer for walking. Acrylic can be applied by a pool company to your existing concrete, requiring no demolition, so it’s a great choice for remodeling an older pool deck on a budget and in a much shorter time. Flagstone is a soft, porous rock that is another excellent choice for pool decking. It absorbs water and dries faster than most other deck materials in use today. Because of those characteristics, as well as its semi-rough texture, it is also one of the most slip-resistant options. Flagstone is very low maintenance and extremely durable. Flagstone can be cut into tiles to complement a formal or traditional deck design. It can also be set in natural slabs to complete the quintessential look of an oasis-style pool area. Any of the materials discussed in this article would make a great choice for your pool deck. It really comes down to your budget and the look you’re after. If you’d like to see and experience these deck options in person, check out one of California Pools & Landscape’s two Arizona showrooms. We’ll be happy to help you choose the perfect material for your dream pool deck.